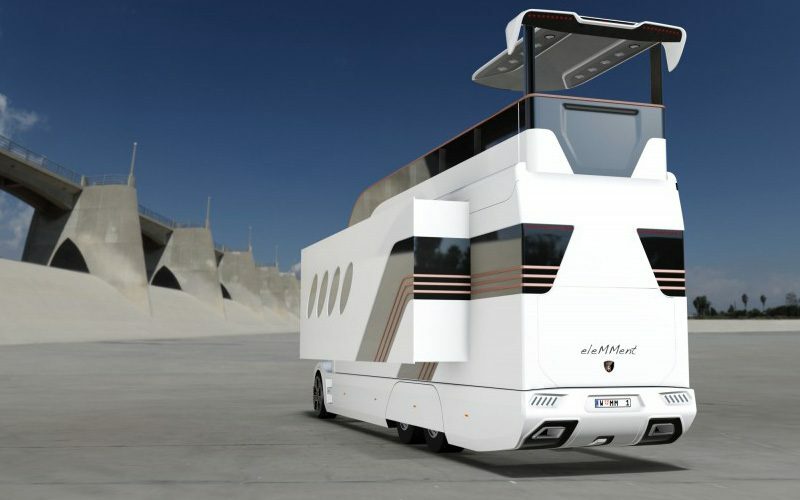 What Is The World's Best RV If Money Were No Object? 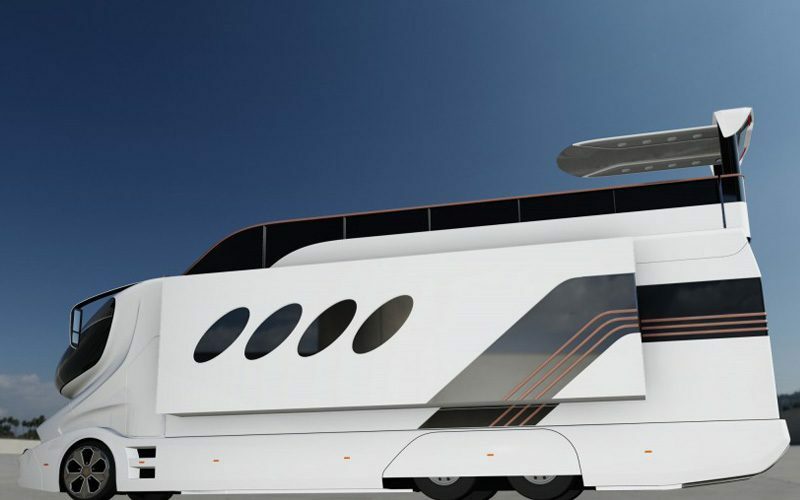 What Is The World’s Best RV If Money Were No Object? They say that money makes the world go round, and while I think whoever said this must have confused the handling of dollar bills with the Earth’s gravitational pull and the laws of physics, they, unfortunately, have a point. The thing that I love most about alternative living is the fact that I get to live a minimalistic lifestyle, where the only van life costs I have to consider are food, fuel, and my internet. It’s much better to not want for anything and to be happy with what you have, but we wouldn’t be human if we didn’t dream about diving into a pool of gold coins like Scrooge McDuck once in a while. Which begs the question; if you had more money than you knew what to do with, which camper would you single out as the best RV in the world, and how much would it cost? Are you full-time vanlifer? Fancy yourself as a weekend warrior? Head over to our Facebook Group and join our ever-growing community! If we’re going to talk about cost alone, then there are quite a few different contenders for the accolade of the best RV. The more that you cram into a motorhome, the more it ends up costing, and some of the campervan conversions that we’ve had the pleasure of looking around have felt more like high-end city flats than rolling homes. But it’s not just the interior that turns four wheel campers into the world’s best RV. Expensive vehicles usually have better suspensions, better tyres, more off-road capabilities, better batteries and solar panels etc. It’s the difference between learning how to build your own camper van like I did, or buying a house that’s had some wheels and a steering column attached to it. So, without further ado, let’s pretend we’ve just won the lottery and have walked up to the most expensive RV dealer in town. Which will be the best RV? Keep on reading to find out. Take A Look At The Best RV That Money Can Buy! 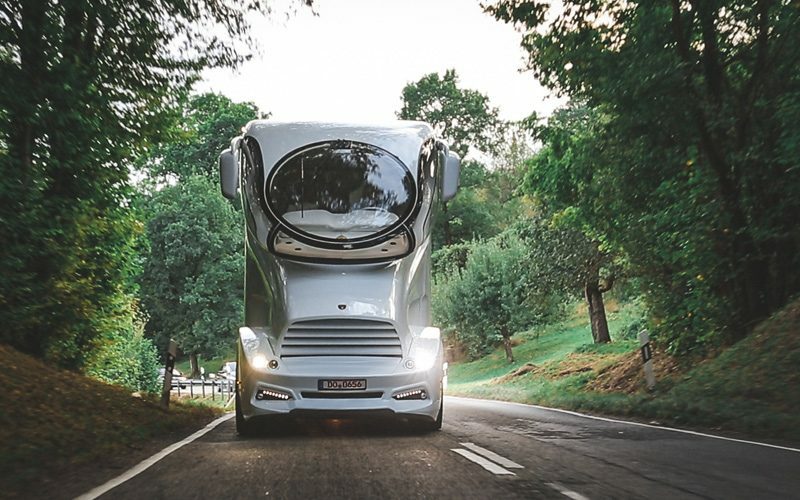 Recognised as the most luxurious camper van in the world by 190 countries, the Palazzo Superior from Marchi-Mobile takes the top spot for the most expensive camper on earth. Remember when the EarthRoamer first came out, and how everyone thought it was crazy that you could spend £1million on a motorhome? Well, you’ll need three times as much money if you want to drive the Palazzo off the forecourt. 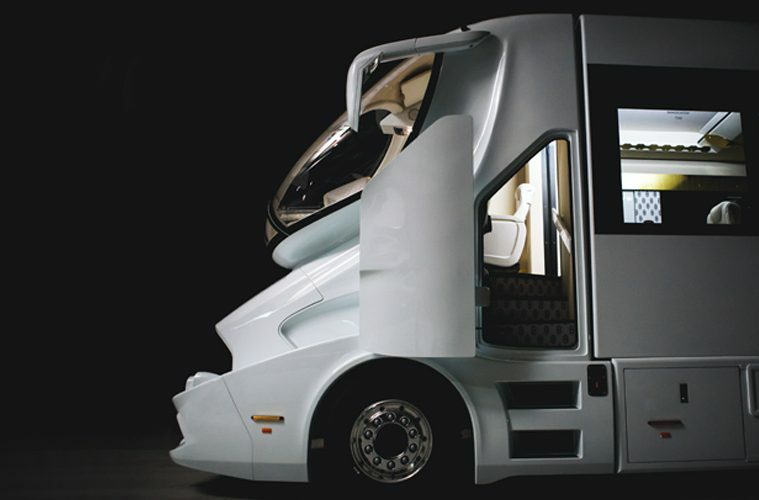 That’s right; this RV costs over £3million, which makes it the perfect vehicle for any movie stars or wealthy Baron’s who love an outlandishly expensive off grid adventure. Just take a minute for that to sink in. Three-million-dollars; most of us will probably never see anything near that amount of money in our lifetime, making it an absurd amount of money to shell out on something that you might end up using a few times a year. But, for the sake of argument, let’s pretend that we’ve got that money and that we’re planning on purchasing the world’s best RV for a jolly jaunt into the wilderness. What are we going to get for our money? Tell Us About The Palazzo Superior? 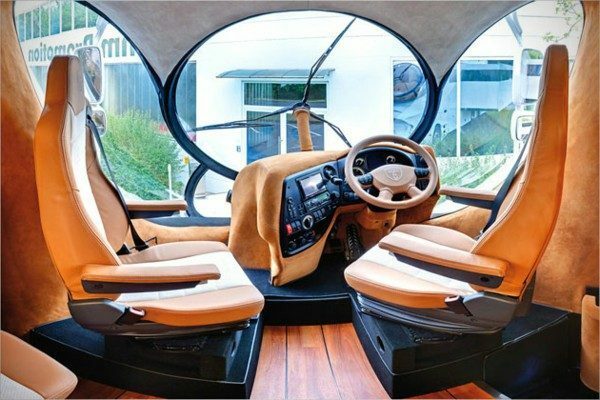 Marchi-Mobile have combined elements of the worlds must luxurious past-times and sports to create this camper. 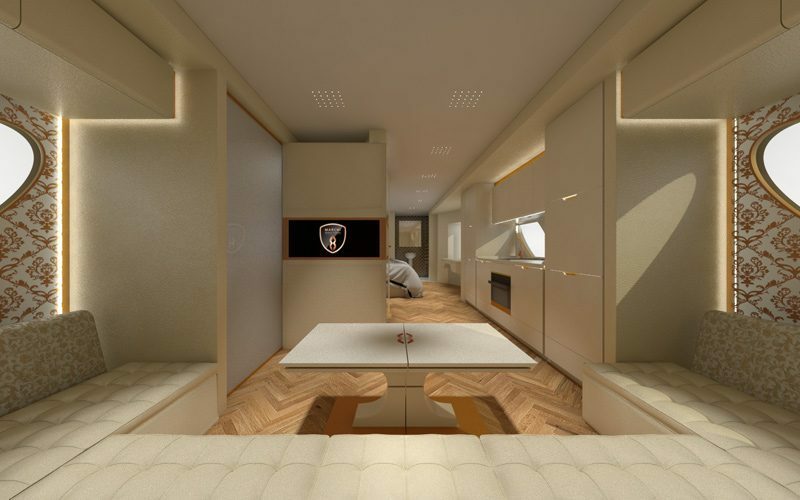 There are elements from the worlds of motorsport, yachting and aviation in the design of this camper, all working together to create some exceptional features that are sure to turn heads, the most notable of these being the futuristic style cockpit. If I’m honest, it looks like a science experiment gone wrong, but conventional design choices don’t end up creating the best RV in the world, after all. Not only does the bubble style window give the driver an immense panoramic view of his or her surroundings, but it can also be darkened in two separate stages to help combat sun glare. That’s pretty high tech stuff and a lot more effective than having a giant sun shield. 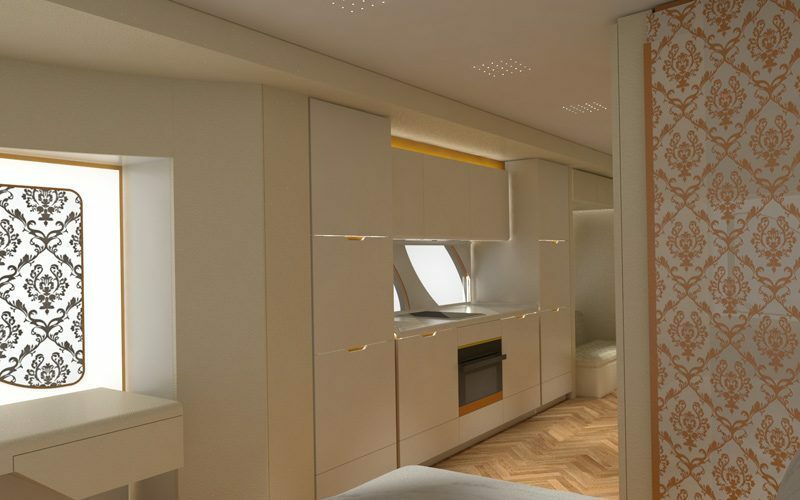 The cab area is based around the cockpit on a private jet with digital instruments designed to make driving much easier, making the camper drive more like a limousine than an RV. The Palazzo uses 36” wheel rim covers, the same kind that you might find on top of the range sports cars. I won’t bother describing the types of terrain that you can drive over in this because it can glide over everything apart from air. What Makes This The Best RV? How many campers do you know of that have a Sky Lounge? The Palazzo Superior earned the title of ‘best RV’ by including some of the most innovative and exciting features that have ever been built into a mobile home. 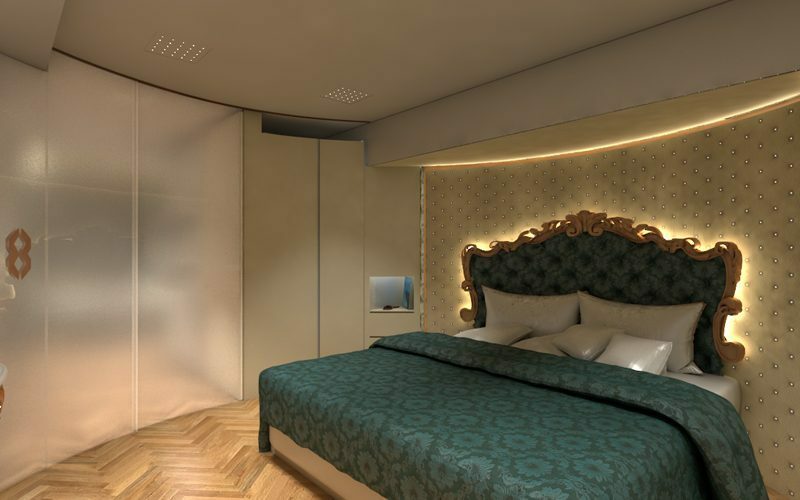 An automatic lift takes you up to a walled sky lounge, allowing the owner to enjoy private views of the world from the top of his or her kingdom. The lounge has integrated furniture and adjustable heating to make even the chilliest of excursions comfortable. Speaking of adjustable heating, the Palazzo utilizes a specially built air convection system which helps to create one constant temperature throughout the entire build. I only have one room in my camper, so I don’t really have this problem, but if you’ve ever tried to heat multiple rooms while in the middle of a snowy tundra, then you’ll probably appreciate this feature. What’s more, the convection system helps to prevent pressurisation when opening up the sliding walls to create a bigger space. Remember, readers, we’re looking for the best RV that money can buy, so save your judgement until the end of the article. What’s Inside The World’s Best RV? The most important thing that I would look for in an RV is a comfortable living space, and the Palazzo isn’t recognised as the worlds best RV because it uses flowery caravan cushions. 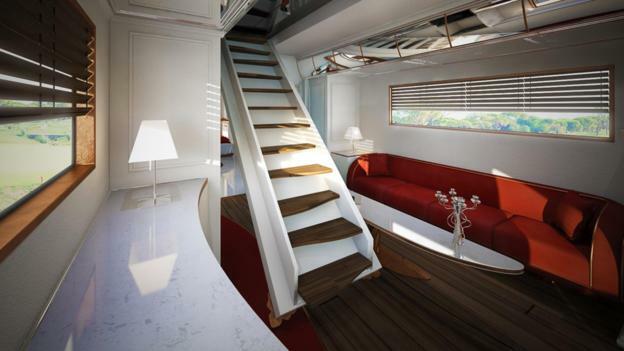 Once you have boarded this monster camper and stepped through the electric sliding doors, you’ll be met with a sofa that spans over four metres which is perfect for relaxing after a long day spent watching your bank account grow. If you’re feeling thirsty then you’re only a short stretch away from a bar that houses a spacious wine cabinet and an ice maker for whipping up cocktails on those warm summer afternoons. If you like to relax back and watch the football or can’t miss an episode of your favourite TV show, then the world’s best RV also features two 42” widescreen televisions. You can listen to your favourite bands or audiobooks on the Steinway & Lyngdorf audio system, hailed by many as providing the best music quality on the planet. Ambient lighting and an onboard digital media system with SAT T.V complete the tech extravaganza. There are so many expensive things inside this camper that I would be scared to leave it parked anywhere! The kitchen in the Palazzo further solidifies its place in the ‘Hall Of Best RV Fame’. You’ll find more top cooking accessories inside this RV than in Gordon Ramsey’s kitchen, making it a perfect choice for the camper that can’t live without millionaires shortbread (they always say that the proof is in the pudding after all). A Lot Of These Elements Are In Other RV’s…What Makes This The King Of all Campers? The bathroom is referred to as a ‘Private Spa Retreat’, with a rain shower experience and a sensory light experience. It also has a towel rail, but I think that just holds towels. An adjoining passage leads right into the Master Bedroom, where you’ll find a luxurious king size bed that is manufactured by the same company that makes the Queen of England’s bed. Apparently, it’s the most comfortable bed in the world, though if any members of the British Royal Family are reading this, then we’d like you to get in touch to confirm whether this is true or not. Storage can be found everywhere within the Palazzo, making it the best RV for anyone who likes to bring all of their shoes, clothes, ties, sweaters, books, dogs, cats, and turtles along on the journey with them. It’s all neatly hidden away out of sight, leaving you to enjoy a mess-free environment while living off grid. Ok, back down to earth with a bump. This may be the best RV according to 190 countries in the world, but to me it’s a showpiece that puts design before the real spirit of van life. I certainly didn’t want to live in a van because I wanted a sensory rainfall experience; if I wanted that, I’d strap a disco ball to my head and stand outside in the rain. I can’t deny that the Palazzo is a spectacular specimen; it is, after all, a work of art. But if you need something this big with all of these fancy bells and whistles in it, then you might as well just buy a holiday home in your favourite country and spend time there instead. Living the van life isn’t about 42” T.V’s and the finest Italian linen, it’s about washing in hot springs and exploring the world in a hand-built tiny home. Maybe I don’t understand the Palazzo Superior because I don’t live in that world; perhaps If I had that kind of money, then I would re-write this article and proclaim how I can’t believe that I’ve lived without a Sky Lounge for so long. The truth is, no one needs these things; the best RV will always be my Vauxhall Movano, with its wood panelled walls and its little squeak when it goes over speed bumps. The Palazzo might be the best RV in the world if you have £3million to spare, but nothing beats a camper that you’ve poured your blood, sweat and tears into. That’s what makes the best RV, and for me, it always will. Check out these Van Life Instagram accounts for some real-life vanlife inspiration! Looking for the best camper security system? You need the Owl Car Cam! Van Life Insurance exists, and here’s how to get it.